Kidderminster Harriers chairman Rod Brown says he understands why fans are unhappy with the state of the club. Cash-strapped Harriers are bottom of the table, have not won a game this season and were knocked out of the FA Cup by seventh-tier Stourbridge. 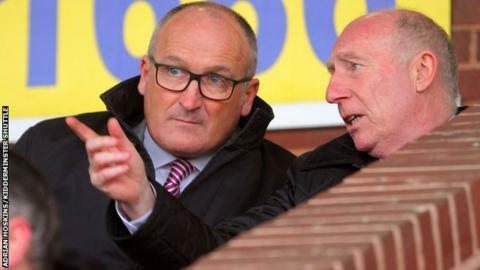 Brown was reacting to a frustrated supporter describing the troubled club as a "shambles". "To be honest I can understand where the fans are coming from," Brown BBC Hereford and Worcester. Harriers have had three different managers this season, with Gary Whild made head of football operations before leaving, replaced temporarily by Colin Gordon, before head coach Dave Hockaday was appointed at the beginning of October. Results have not improved and the 3-0 defeat at the Glassboys has been the lowest point in a desperately disappointing season so far, that has seen them go 18 matches without victory - leaving them eight points adrift at the bottom. "After Saturday's game it's a very depressing situation," Brown added. "I didn't see that coming. It was very poor and a bit of a watershed moment. "We want to take the club forward but we're having to take a lot of pain." Harriers' longstanding financial problems are still "difficult", according to Brown, who has been managing debts of several hundred thousand pounds to ensure the club has a long-term future. "This club has suffered the same problem - they've chased a dream being at the top but not been able to afford it," he said. "To be honest it was lucky to make it though last year. You're trying to reduce deficits that have been carried forward that are in excess of £200,000 and £300,000. "Kidderminster Harriers does not have a major benefactor and we never started with a blank piece of paper. I wish we had, because it would be so different setting up the structure. "We didn't anticipate the results we've had. It's been difficult."